This is 100g of Potassium Ferricyanide from Photographers' Formulary. It is mainly used in bleach baths, such as a bleach prior to sulfide toning, as well as a component in iron printing processes and dye-toning formulas. 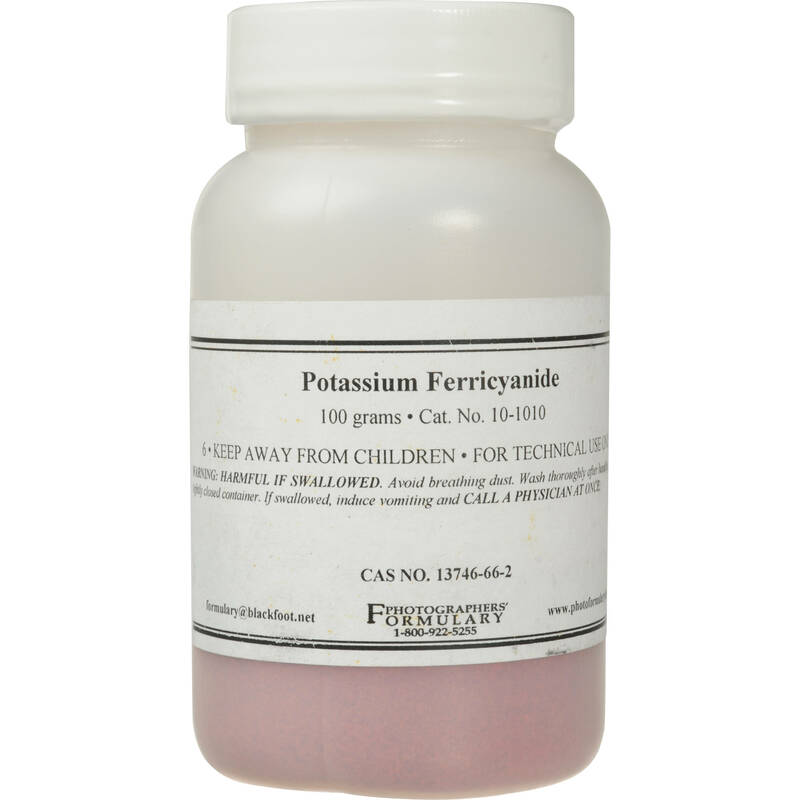 Box Dimensions (LxWxH) 3.5 x 2.3 x 2.2"
Potassium Ferricyanide (100g) is rated 4.9 out of 5 by 10. Rated 5 out of 5 by Nitz Photo from Just what I needed! Very useful for removing black spots from a silver gelatin print. Takes some finesse just like spotting a print. Rated 4 out of 5 by Sun Printer from Good for Cyanotype B solution I use this for my cyanotype solution B. I get more consistent results with mixing my own chemistry. Rated 5 out of 5 by JJLouis from Perfect! Perfect product! Exactly what I ordered and shipped super fast as always! Rated 5 out of 5 by Richmann from Exactly what I was looking for Wear approiate safety gear. This is a toxic chemical. I have several fibre prints which are printed about half to one stop darker than I would like, can I use potassium ferricyanide as bleach to brighten them up a bit? What is the best dilution ratio? Is it still okay to selenium tone the prints after bleaching? It is better to use a Farmer reducer for a whole print bleaching. And yes after the bleaching prints can be toned in celenium.